As a Nexus 7 owner, there’s no need to be embarrassed by your typing or inability to spell. The Android keyboard sports two text correction features that you’ll find most forgiving: Auto Correct and Next Word Prediction. Tap a word suggestion to instantly type that word. Try to keep up! Sometimes, you can type a whole sentence by simply tapping out suggestions. 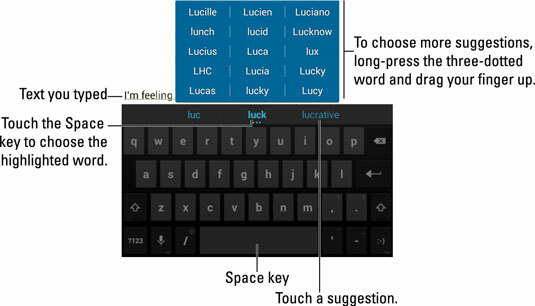 To select the highlighted word, simply tap the Space key. This trick works only when a highlighted word is in the list. To see further suggestions, long-press a word with three dots beneath it, such as the word luck. You see a pop-up palette of suggestions. Drag your finger up, and release it over a specific word to “type” that word. Touch the Settings key to summon the Input Options menu. If you don’t see the Settings key, long-press the Microphone key, and then drag your finger up to choose the Settings key. Choose Android Keyboard Settings from the Input Options menu. The Android Keyboard Settings screen appears. Ensure that a check mark appears by the item Sound on Keypress. Yeah, this isn’t the Auto Correction or Next Word Prediction item, but it’s nice to set the audio feedback option. Ensure that the Modest option is chosen. Modest is the setting normally used by the Nexus 7. If you want more and better corrections, choose Aggressive or Very Aggressive. Ensure that there’s a check mark by the item Next Word Prediction. Touch the Back navigation button to return to the Android Keyboard Settings screen. Touch the Back navigation button again to dismiss the Android Keyboard Settings screen. When the keyboard isn’t visible, you can get to the Android keyboard Settings screen by opening the Settings app, found on the All Apps screen. Choose the Language & Input item, and then touch the Settings icon next to the Android Keyboard item. Proceed with Step 3.